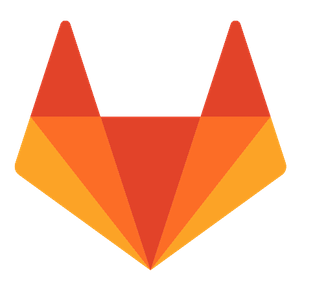 Gitlab is a fully featured GIT based repository server that allows users to among other things, to create and manage code repositories, track code issues, perform code reviews, define CICD pipelines, perform unit tests, create and manage docker registries, and much much more. 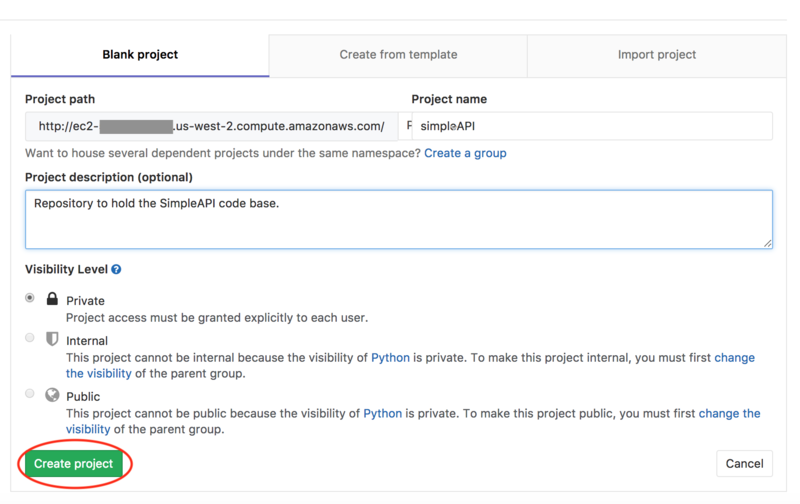 This tutorial will walk through the steps required to create your first group, create your first project, and make your first commit on either your own Gitlab server, or to a repository on https://gitlab.com. Before we are ready to commit some code to a repository, first we must create the location in Gitlab where we will keep the repository that we will ultimately be committing to, perform the following steps to create the project, and configure our repository to get ready for our first commit. The first thing we need to do is to set up a group, where we can place a new project, that ultimately will be the repository where we commit our code to. In order to do this, log into Gitlab, and click on the Create a group option from the main dashboard screen. 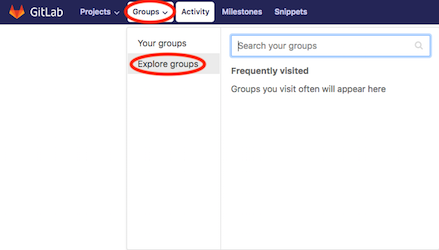 If the button does not appear because you already have groups defined, then from the navigational menu, click on Groups, and then choose Explore groups. This will bring you to the Group view, where you can click on the New group button. Once on the new group view, fill in the group details, and click on the Create group button. 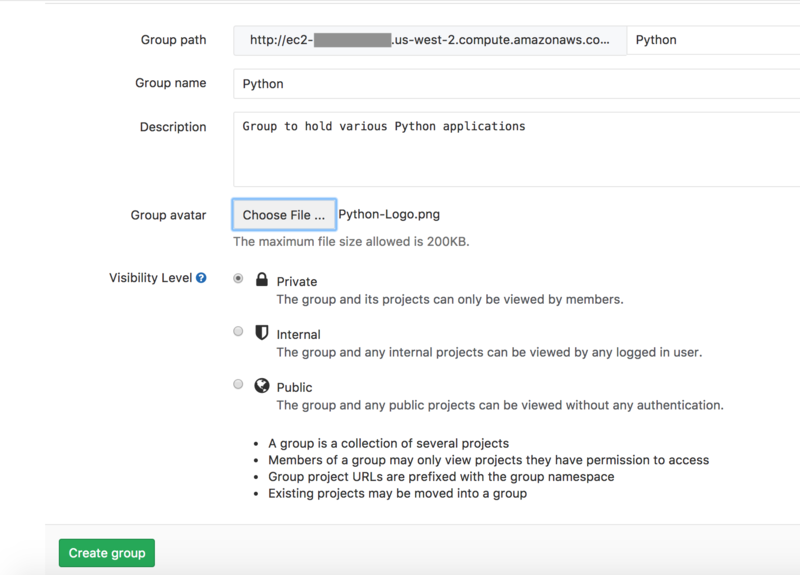 Once the group has been created, Click on the group, in this example being the Python group, and then click the New project button to create a new project, then fill in the project details, and click on the Create project button. Once the project has been created, hit the Copy URL to clipboard icon to copy the git address to your clipboard. Now that we have our repository created and configured, lets move over to our desktop to get some code ready for its first commit. The first thing that we need to do is to make a local directory on your local workstation where your git project can be constructed. 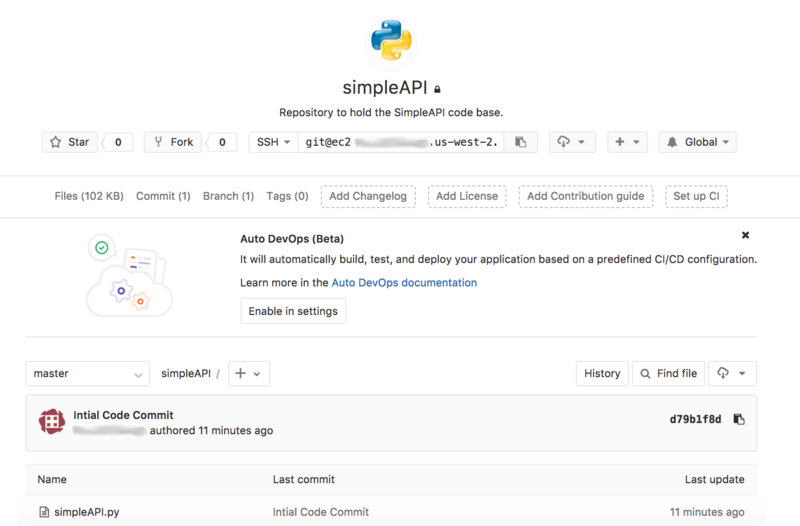 Follow the steps for your platform to create a directory named SimpleAPI on our workstation and open a command shell, and navigate to the newly created directory. Now that we have GIT initialized, now we need to tell the local git repository what remote GIT repository to push to. We do this with the git remote add command, combined with referencing the URL that we copied to our clipboard previously. The word origin between our command and the repo URL is the arbitrary name of the upstream remote repository. We name the remote repo locally, in the event that we want to add multiple upstream repositories to the local repository. For example, origin could be replaced with Gitlab, or Github, or any other identifiable remote git server/service identifier. Now that we have Git and our repositories all set up, we are ready to create a file named simpleAPI.py and paste the following code into the file. Now that we have the directory, repositories and code file all set, its time to make our first commit. From the command line, simply use the git add --all command to add all files in the current directory to the commit, and then use git commit -m "Message" command to make our commit. git add --all; git commit -m "Intial Code Commit"
Once the push has completed, you can log into Gitlab, click the project and you should see your new commit. Congratulations, you have successfully pushed your first commit to Gitlab! Other than removing the local files from your workstation and deleting the repository, and group, there are no steps necessary in order to clean up or roll back the steps provided in this tutorial. 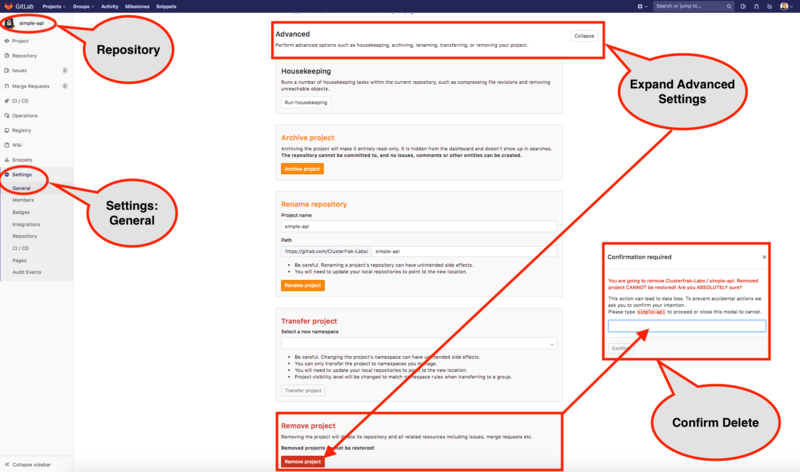 In order to delete a project from Gitlab, simply navigate to the project/repository within the Gitlab console, Click on the the repository Settings, then under the General settings, click the Expand button in the Advanced section. Next, scroll to the bottom and select the very last option titled Remove project. This will envoke a dialog confirmation box. Type the name of the project/repository into the delete confirmation dialg and click Confirm. After this step, the repository and all history of it will be deleted. This tutorial has gone over creating your first Gitlab group, project, and then finally the projects first commit. There are many additional things that we can do with Gitlab outside of the scope of this article. Future articles will cover Git flow, merge request stategy's, forking, and other topics that are relevant to the Git ecosystem. It is highly encouraged to poke around Gitlab futher and get used to the UI or CLI options to become a true Git Ninja. You can also add additional users to your Gitlab instance and grant those users various permissions on your repository to allow them to clone, branch and merge changes back to this mock codebase. "Git" coding and Enjoy ! !